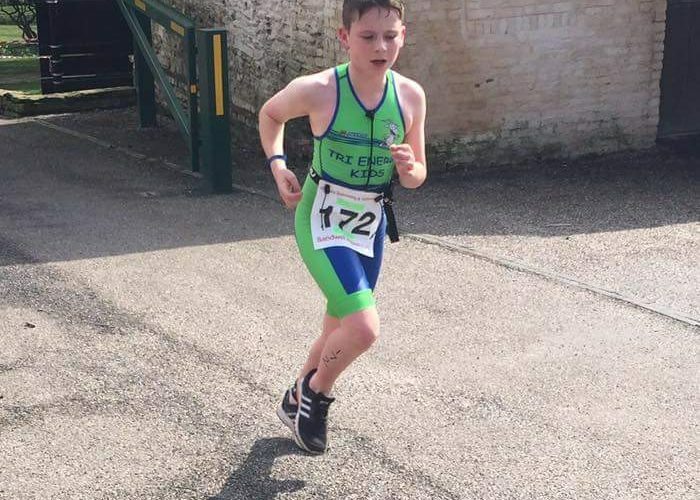 A huge thank you to Derren (Jenson’s Dad) for sending in this fabulous race report from the Sandwell Aquathlon. Well done to all who took part! Sandwell Aquathlon was another well organised event. Following on from their recent exploits at the Wombourne Aquathlon; Dan, Bobby, Sammy and Jenson were joined by Charlie at Sandwell. The course was……..hilly to say the least. Dan described it as either going uphill or downhill with winding paths and hairpin bends but not much in the way of flat and straight. The swim started in groups of 8 or so rather than the 45 second intervals at Wombourne so it certainly felt more of a race than a time trial. This race aspect certainly caught Jenson out as he tried to keep up with the faster swimmers and tired towards the end of his swim. Exiting the swim he was fifth out of the seven taking part. Into transition and the Tri Energy Kids all looked fantastic in their new Trisuits. They were the hot topic of the day whenever the kids bumped into each other. “Have you got your trisuit on?” as they intially met up in the morning and “Did your Trisuit make you faster?” was the burning question after the event. The Trisuit certainly paid dividends for Jenson, halving his transition time compared to Wombourne, and exiting in 3rd place. The first 450m out of transition was a cruel uphill climb, which was particularly cruel for the TrStarts of Sammy and Jenson who run 600m in total. All the kids seemed to be having fun with super focused faces when competing, this time however they also looked really professional in their new Trisuits. Another great event. One note for parents who have younger children taking part. The pool and the run are in two separate locations separated by around 400m (which forms part of the kids run). As a result it is not possible to cover the whole course and keep an eye on them unless there is two people accompanying them. It’s not necessarily a problem as there were lots of marsals to guide the children but you can’t view the entire race distance.